The Friholts and the Orust movement have a life-long commitment and multi-dimensional work for non-violence, global development, women rights, art and poetry. They represent the finest aspects of the Nordic civil society and public education tradition and peace work. They are also behind what can be characterised as the most important annual series of public lectures, in the Henån Cultural Centre, held by researchers, journalists and authors – always with a humanistic, globalist, critical and constructive perspective. It’s dialogue, not confrontation, it’s deep and it’s broad. High on intellectualism and integrity, low in terms of populism, political correctness and sectarianism. Free thinking for open minds. 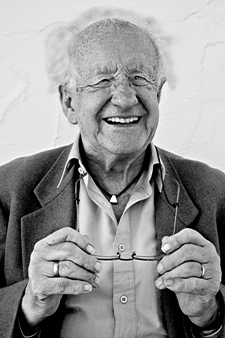 In short, the most important peace movement in the Nordic countries with a larger following in local society than anywhere else, a local-global movement in the spirit of Gandhi and with a straight line back to Galtung’s first book, with philosopher Arne Næss, Gandhis Politiske Etikk – Gandhi’s Political Ethics – from 1955. None whatsoever – if we are to believe Swedish and international media – which of course we should not. But quite significant in terms of substance – for research, peace, free opinion-formation and the Nordic civil society movement traditions (democracy) – and as constructive comment on today’s Swedish/American security and foreign policy which, beyond doubt, Alfred Nobel would have deplored. That is – for the ethics of resistance and alternatives. For hope beyond the militarist world and its increasingly destructive thinking. Saturday the 2nd of December 2017 at the old Svanvik School at Stocken, Orust 10 AM. Lectures by Johan Galtung (just arriving from Washington) and Jan Oberg (about Galtung), lunch music, torchlight procession and then at 7 PM the Nobel Banquet with the awarding ceremony. Arranged with the support of the Orust Municipality and Sensus Association for public education and culture.